When a spacious cabin, great mileage, and expert handling are needed, the compact crossover is the perfect answer. The Chevrolet Equinox is the compact crossover that is helping millions of drivers see the beauty of driving an SUV, without all of the extra weight and money spent at the pump. 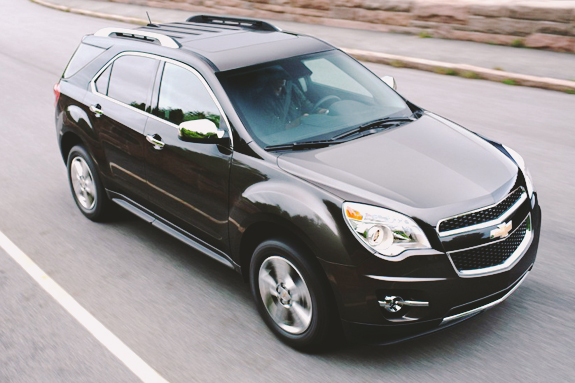 The first generation Equinox rolled off the assembly line in 2005, and has been a leader in its segment ever since. Outselling tough competitors like the Ford Escape, the Equinox has been a leader in practicality, comfort, and sophistication for the past ten years. The 2015 Chevrolet Equinox does not spare any of the above traits, all while packing plenty of extras, including the most current in-vehicle technologies. Whether its the Basic LS trim level, or the Luxury Performance LTZ package, the 2015 Chevy Equinox is proving once again that quality of craftsmanship and attention to detail, are what keep drivers coming back for more. When it comes to choosing a compact crossover, it’s crucial to have all of the facts. Aside from Chevrolet being a forefront in safety and quality, the Equinox also outweighs the competition in price, gas mileage, and a few other areas of importance. Check out all of the ways that the 2015 Equinox leaves the 2015 Escape in the dust. Price: Arguably one of the most important aspects to consider when purchasing a vehicle, the starting MSRP of the Equinox outshines that of the Ford Escape. The 2015 Equinox starts between $24,500 and $33,000 - while the 2015 Escape starts at $26,000 and tops out at $32,000. Consider also the cost of ownership, the Equinox will cost drivers considerably less at the pump, saving a lot more money over time. Engine: If power, expert handling, and strength are important, then look no further than the ECOTEC engine under the hood of the 2015 Equinox. Drivers can choose between the standard four-cylinder, or the more powerful V6. Gas Mileage: Both vehicles fall in the compact crossover category, but the Equinox outdoes the Escape where it might matter the most - at the pump. The standard Equinox achieves 22 city, and 32 highway MPG, while the 2015 Ford Escape falls short with 22 city, and 31 highway. What seems like a minor difference, will most certainly add up over time. Towing: The Equinox outperforms the Escape in this department, towing an impressive 3,500 pounds with the optional V6 engine. The 2015 Escape can only achieve this number when equipped with the 2.0-liter engine, and the expensive addition of the Trailer Tow Package. Passenger Room: Equipped with sliding and reclining second row seats, the Chevy Equinox leaves ample legroom for back seat passengers without compromising comfort. With the second row of seating folded down, the Equinox impresses with 63.7 cubic feet of cargo capacity. The Ford Escape tops out at 34.3 cubic feet, and lacks storage throughout its cabin for smaller, everyday items that the Equinox can easily accommodate. Safety: The question on everyone’s mind: is it safe? The answer, whether looking at the Ford Escape or Equinox, is YES. Each crossover has great safety features, but the Equinox outdoes the Escape when it comes to standard safety features. All 2015 Equinox models come standard with OnStar, and a rearview camera comes standard on all trim levels aside from the base LS. Both the Equinox and Escape received four out of five stars for safety in overall crash protection from the NHTSA, but the Equinox outdid the Escape in the Insurance Institute for Highway Safety tests - earning the best possible score for moderate-overlap, side-impact, and roof-strength tests. The 2015 Chevy Equinox easily surpasses the Ford Escape in all of the above areas, further securing its place as one of the most popular compact crossovers on the road today. The 2015 Equinox has set a new standard for interior comfort and sophistication. The cabin of the Equinox exudes luxury, all while maintaining a familiar level of comfort. Check out just a few of the details Chevy put into the 2015 Equinox to ensure a comfortable ride, every time. Multi-Flex sliding, reclining rear seat - Complete with a 60/40 split seatback. Front reclining bucket seats with power height adjuster and driver power lumbar support. Optional remote engine start can also work to activate heated mirrors and defrosters when the outside temperature falls below 45 degrees. Staying connected in today’s world isn’t just a convenience, it’s a necessity. 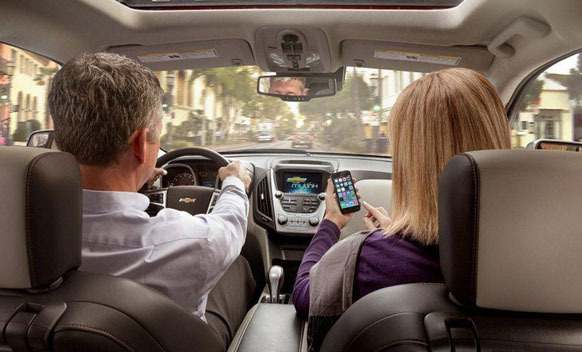 Chevrolet recognized that when they designed the 2015 Equinox, and took steps to ensure that regardless of location, connecting would be possible. With the available 4G LTE Wi-Fi, the 2015 Equinox transforms into a portable mobile hotspot, allowing up to seven devices to connect at one time. The 2015 Equinox comes with a three-month/three-gigabyte data trial. Chevrolet has pioneered this technology, and no other automotive manufacturer has been able to match it. Complementing the mobile hotspot, OnStar comes standard on the Equinox, along with six months of free OnStar Directions and Connections. OnStar’s Advisor-based safety technology includes Automatic Crash Response, turn-by-turn navigation, and Stolen Vehicle Assistance. RemoteLink Key Fob Services - Owners can lock/unlock a car from anywhere, as well as remotely activate lights and horn. Vehicle Diagnostics - Runs monthly checks of the engine, anti-lock braking system, and transmission to ensure the vehicle is running smoothly. Dealer Maintenance Notification - Automatically sends a diagnostic report to a preferred Chevy dealer to set up needed services. Deciding to purchase the 2015 Chevy Equinox is easy, but choosing a trim level can be more difficult. The LS is the most basic and most affordable version of the Equinox, while the LTZ is the most expensive, packed with the most standard features. Starting below $27,000, this version of the Equinox comes packed with practical features like a 6-speed automatic transmission, StabiliTrak stability control system, Sirius XM Radio, USB connectivity, and OnStar. This is a great option for those looking for affordability without compromising practicality. Starting under $34,000, this trim level does not skip a beat when it comes to luxury and convenience. Heated front seats, power liftgate, Pioneer Premium Audio System, rear vision camera with rear park assist, Forward Collision Alert and Lane Departure Warning, and the LTZ Exterior Appearance package are only a few of the highlights that come standard on the 2015 Equinox LTZ. Whichever trim level you prefer for your 2015 Chevrolet Equinox, you can rest assured that you are driving a quality vehicle that will last you years to come.